Life is so relentless sometimes, isn’t it? This is certainly one of those weeks where the saying “When it rains, it pours” seems especially poignant. Our dishwasher began leaking a few weeks back. After much tinkering and tweaking, my husband and father-in-law thought they had it fixed but then, two weeks ago, it failed again. And so, since October 6th, I have been washing all dishes by hand. I haven’t figured out my new rhythm with the additional time required to complete this chore. My sink is now rarely empty; dirty dishes make a constant companion. My counter tops and even my oven are covered with drying dishes at all times. Not having a dishwasher is truly a “first world problem” but it has wrinkled my routine nonetheless. The kids are getting to bed late every night because dinner clean up now takes twice as long. I am keenly aware of the use of every dish, every spatula, mentally tracking whether both a fork and spoon were truly required for the meals’ consumption. My kids look at me in bewilderment as I catch myself raging that they would use separate cup for first water and then milk. “You already HAVE a cup,” I wail, envisioning the pile of dishes to be hand-washed, tripling by the second. They have no concept of conservation, recycling, reuse when it comes to the plates and cups. And it’s true! Filling the sink after dinner quickly became like a fast-pass to alone time for me. My family knew if they were anywhere in the near vicinity, I would put them to work. So, they made themselves scarce. For a few days, I almost welcomed the dish-washing process simply because of the quiet it guaranteed me. But after about the 53rd time doing the dishes, I was over the novelty. It was then that we discovered a leak in our roof. The loud, echoing DRIP-DRIP-DRIP coming from the family room, magnified by the metal of our fireplace insert, was pretty hard to miss (though certainly we did try). The rain was pouring down outside, and we wondered if it would soon be pouring inside as well. Sigh. Neither of us were really in the mood for another household malfunction. The night before, the light in the dining room had also quit working and if there was such thing as an “expiration date” for an entire house, it was beginning to look like it was RIGHT THEN for us. With the number of items on our “To-Fix” list growing ever-longer, I felt the world closing in on me. Money is tighter than it's ever been and all I could see were dollar signs spinning around me as each piece of our home bit the dust. But we had to do something. Three people had already taken a stab at our dishwasher and declared the issue beyond their area of DIY expertise, so I decided to pull out the big guns. I phoned a repairman who quickly determined that the dishwasher’s electrical control panel was done-for and its replacement would cost just as much as a new machine. Serenaded by the DRIP-DRIP-DRIP of our friendly roof leak, I called Graham at work to tell him the bad news and headed upstairs to fold a load of laundry. As I reached into the dryer, I was surprised when my hand met sopping wet clothing. “That’s odd,” I thought, “I know I turned this thing on.” I checked the lint trap. Its contents were minimal and definitely not the cause of the failed dry cycle. “You have got to be kidding me!” I exclaimed, with Jack as my audience. I took a deep breath and went back to face the dryer. Slowly and with great precision this time, I punched each button to restart the cycle. Again, I repeated the process. The machine powered on just fine. It changed to the proper setting without issue. But whenever I pressed the start button, nothing happened. Seriously?! This absolutely cannot be. I grabbed my phone and shot Graham a text: “Ummm….soooo….the dryer just quit working.” My phone rang immediately. Graham proceeded to tell me there was an alarm going off inside the Honda that he could not get to turn off. Of course there was! It was almost laughable. Totally overwhelmed and bewildered, we prayed over our chaos. We prayed for God’s hand of protection over our family and our house (!!) and for wisdom as we determined which issue to take on first. After we finished praying, Graham sarcastically quipped that I should just give him a call when the fridge gave out. And then we hung up. That’s honestly kind of how I feel too. It hasn't been an easy week to begin with. In fact, these home failures felt like merely the icing on the “cake” of the emotional roller coaster we’d already been facing. We’ve been stressed and tense. Our family is going through a lot right now and the frustrations I've outlined are just the challenges that are externally apparent at present. Life feels so heavy and complicated. I’m still at a loss. I am baffled by the chaos, confused by the unabating nature of the waves careening our way. But at the same time, I feel a sense of peace. I have been reminded in all sorts of little ways, that our God is mighty, and He is present even in all of this. I have also been so touched by the way He uses community. Multiple friends offered to do my laundry (which, by the way, I said yes to and it was delivered to me, dried and folded this morning). Another friend came and dropped off a bottle of wine. I asked my parents to pray for us and my dad was ready to change his plans for the weekend and come give us a hand. A neighbor offered up the use of his tall ladder for closer examination of our roof. An SOS text to a close-knit group of women resulted in all the encouraging, empathetic and “We’ve got your back, Sister” uplifting texts that I needed. And then, get this you guys – Graham’s dear college friend flew in for a visit last night, arriving right in the middle of all our drama. He took one look at our dryer and exclaimed that he had the exact same one at home AND it just so happened that he took the whole thing apart last month and knew the innards well. 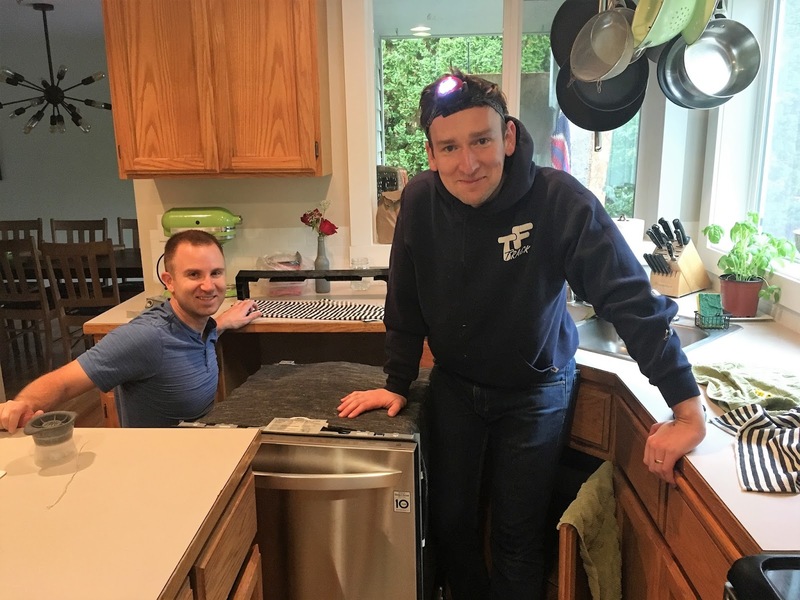 Ten minutes later, the two guys had the dryer back off, the problematic part identified, and a new one ordered on Amazon. And, wouldn’t you believe it, the part that failed was the exact same part that failed on this friend’s dryer last month. Coincidence? I think not. May we not grow faint of heart and lose hope when faced with the trials of this world. Instead, may we experience His lavish love and provision, sometimes in the most unexpectedly beautiful ways. Amen?